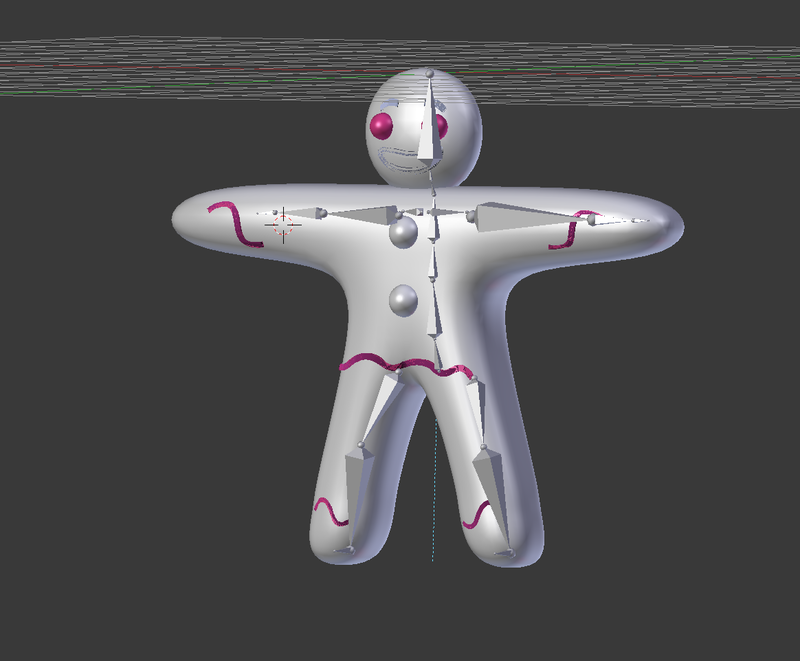 i have rigged this gingerbread man, and also i have made everything one object so when i rig it, the WHOLE gingerbread man will move. but when i parent it, it says " bone heat weighting: failed to find solution for one or more bones". how can i fix this? EDIT: after trying to figure out the problem, i discovered this problem only occurs when i set the parent with automatic weights. hope that helps. If you want the frosting move according to the main body I would recommend the DataTransfer modifier as solution. Therefore you should parent the frosting to the same armature as the Gingerbread man. But you don't have to make weights just the empty vertex groups. So, for Bone deformation we need the Vertexgroup information projected from the Base(your gngerbread man) to the Addon(your frosting). 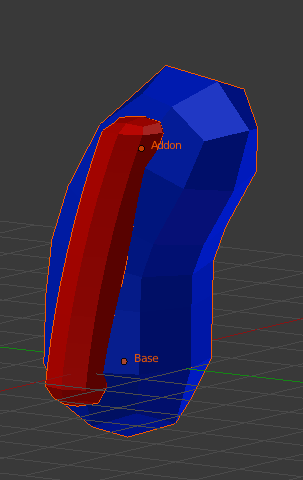 The modifier has to be on the Addon and it should look like this. After getting the weight information from the base object you should be able to join the two meshes together(but you don't have to). The frosting should have reasonable weighting. 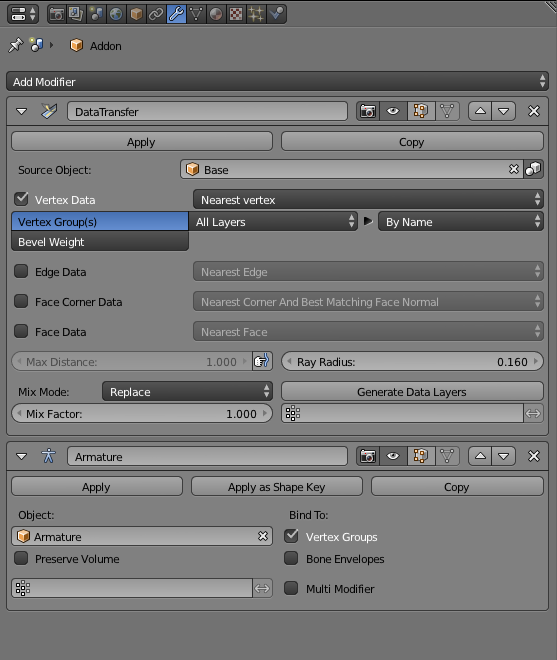 After projecting the vertexgroups you have to apply the DataTransfer modifier, because it will automatically recalculate it when you change your pose. Parent just one object at the same time to the armature. The reason the automatic parenting is failing is because it has a hard time with very dense, overlapping meshes. The solution is to either make the frosting meshes much less dense or finding another way to put the frosting on the gingerbread man. One way to put frosting on your gingerbread man is to paint it on using texture paint. I gave it a quick try and it seems to work quite well. I used the Lightmap Pack UV unwrap option, then went to texture paint mode and added a paint slot. The head of your character does appear to have double vertices which will need to be removed before painting though. After that just select the base color and use the fill tool to color the base, then choose the frosting color and paint it on. It will take some practice if you're new to texture painting, but it's definitely a possible way to go about adding the frosting. As far as reducing the amount of vertices if you want to keep the frosting as a mesh object, I would suggest starting with a cube, scaling it down to the width of the frosting, selecting a side face and using Ctrl Click to extrude the face and create the shape. Then add a subsurf modifier at the end to make is smoother. Currently the mesh is just too dense to simplify effectively, and you would spend more time working with the frosting objects you have than if you make new ones. Not the answer you're looking for? Browse other questions tagged cycles rigging bones or ask your own question. Bone heat weighting failed to find solution!